Justice Anthony M. Kennedy, for whom Gorsuch once clerked, administered the oath to the court’s 113th justice. At 49, the former federal appeals court judge from Colorado is the youngest justice to serve on the court in 25 years. 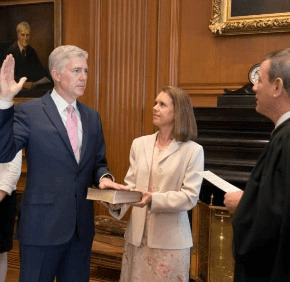 Earlier in the day, Chief Justice John Roberts administered the constitutional oath in a private ceremony inside the Justices’ Conference Room at the court. In his remarks in the Rose Garden, Gorsuch said he felt humbled by being called to serve on the nation’s highest court and he told his former law clerks he was grateful for their service. “Your names are etched in my heart forever,” he remarked. He was confirmed for the court April 7 in a 54-45 vote. The move came after lawmakers a day earlier had voted 52-48 along party lines to approve a rules change introduced by Senate Majority Leader Mitch McConnell, R-Kentucky, to cut off debate and allow confirmation of Trump’s nominee by a simple majority, rather than the 60 votes needed. Gorsuch has been a judge of the U.S. Court of Appeals for the 10th Circuit, based in Denver. Nominated by then-President George W. Bush, he was unanimously confirmed for the circuit court in 2006 and that same year, he received a “unanimously well qualified” rating from the American Bar Association.